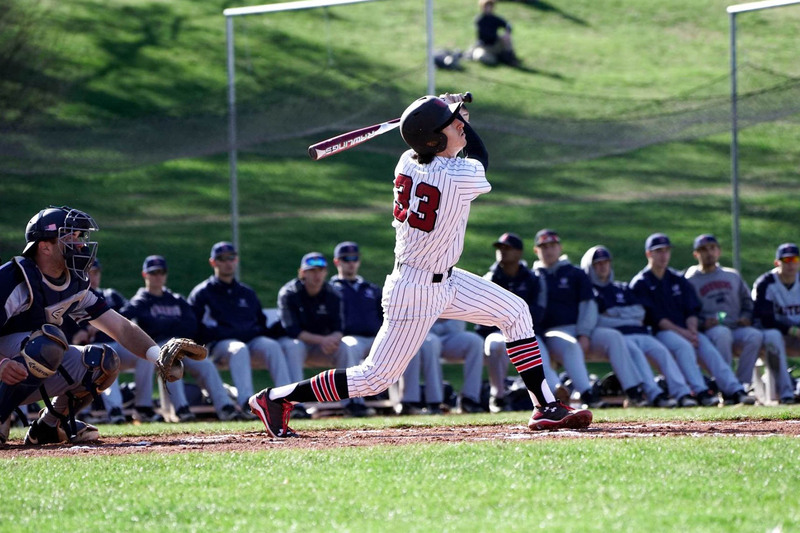 Heading into the past weekend, baseball sat at an impressive 13-3 but had yet to play a game against their conference rivals in the NESCAC West, which consists of Wesleyan, Middlebury, Amherst, Hamilton, and Williams. On Friday, Wesleyan hosted the Middlebury Panthers and fell 7-4, dropping them to the bottom of the conference standings. This poor positioning would be short lived. 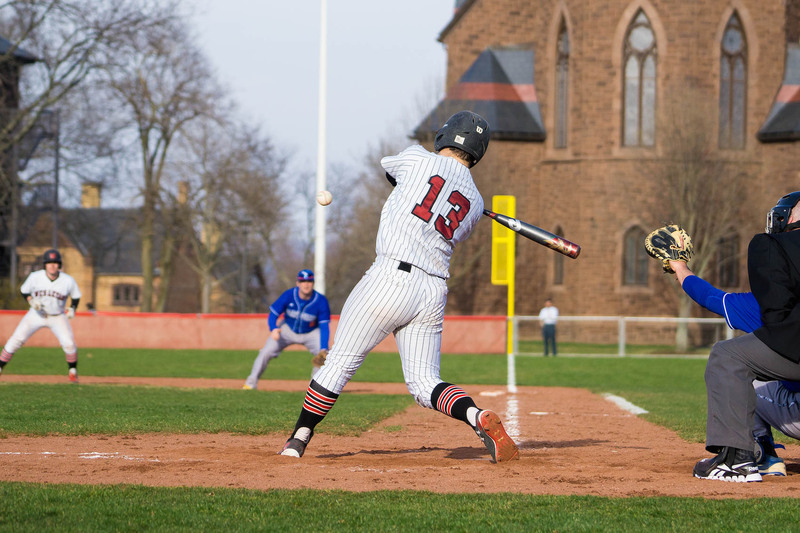 The next day, the Cards took both games of a doubleheader against the same Middlebury squad, improving their NESCAC West record to 2-1 and vaulting to second in the standings. 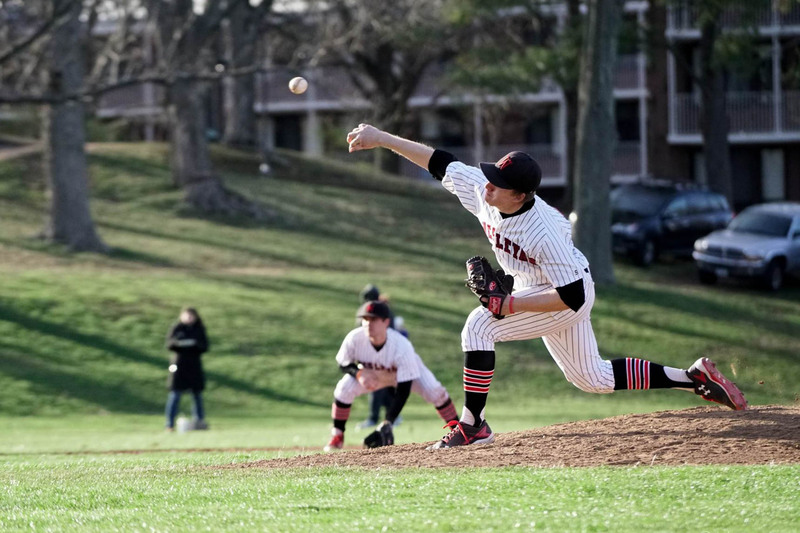 Middlebury bats were able to jump on Ethan Rode ’17, the starting pitcher for the Red and Black, early and often. After a scoreless first inning for both sides, Rode surrendered three runs in the top of the second. Andrew Keith ’19 drove in a run in the bottom of the frame, and Matt Jeye ’18 picked up another for the Cards with a steal of home in the third. By the end of the fifth, they had clawed back to tie the game at three. The top of the sixth, though, spelled more trouble for Rode. Four runs crossed the plate on just four hits. With runners on first and third with two outs, Asher Young ’17 replaced Rode and got out of the jam with a fly out. By that point, though, the damage was done and the Panthers led by four. Wesleyan tacked on one more in the bottom of the ninth, but ultimately was unable to put much of a dent in the deficit and fell 7-4. Young was one bright spot on a dull day for Wesleyan, throwing three and a third innings of scoreless relief. Jeye and Keith both had two hits, and Jordan Farber ’16 had a triple and a walk. Perhaps most unfortunate was Marco Baratta ’16. He reached base four times on three walks, but somehow never came around to score. In the first contest of Saturday’s doubleheader, it was the Redbird bats that came out of the gates hot. Patient Wesleyan hitting and the Panthers’s disastrous defense allowed four runs to plate in the first inning, more than enough support for Cardinal starting pitcher Peter Rantz ’16, who allowed just three hits in a complete game effort. Wesleyan kept pouring it on, though, and had already scored eight by the bottom of the fourth. From there, Rantz coasted his way to an 8-1 victory, his fourth of the season. Guy Davidson ’16 did it all for the offense, reaching base safely in all four of his plate appearances. Baratta also had a great outing with three hits, two RBIs, and two runs scored. Keith also scored twice for the Redbirds, who left seven men on base. This marked the fifth straight game in which they had left as many or more runners stranded as their opponents. Mercifully, this streak came to an end the following day in a romp over the Panthers. Wesleyan’s big inning this time came in the bottom of the third, when they opened up a 6-0 lead and batted around. They scored in every inning from then on out barring the fifth, but it was unneeded as the pitching staff had little trouble with Middlebury’s order. Nick Miceli ’17, who has been masterful both at the plate and on the mound, improved to 5-0 on the season with six innings of four hit ball. Ryan Earle ’19, Doug Hartshorn ’19, and Wilson Flower ’16 each threw scoreless innings in relief to close out the game, allowing just one hit between them. In total, the pitching staff struck out 10 batters, with 8 of those strikeouts coming from the arm of Miceli. Wesleyan’s sticks produced an impressive 16 hits, with 4 credited to Will O’Sullivan ’17. Keith also reached base four times, while Farber and Jeye reached three times apiece. Keith scored four runs in the contest, cementing his place atop the NESCAC leaderboard. Wesleyan holds the top four and six of the top eight spots, with Farber, Davidson, and Baratta rounding out the upper echelon. Eric Jones ’16 has been frustrated by the team’s inability to practice this week due to the weather, but said they have still been able to make improvements in their limited time. This weekend, Wesleyan takes on the rival Ephs on Friday and then in a doubleheader on Saturday. Williams sits at the bottom of the NESCAC West with a 6-13 overall record, and 2-4 in conference. Despite this, Jones wouldn’t directly answer whether he liked his team’s odds.